14 Comments on Tree forming-Landscaping from the inside out. 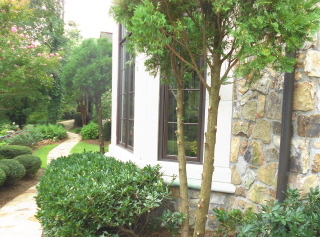 The trees, including a large crape myrtle on the other side of the walkway were blocking the view of the distant mountain, and the arborvitae was blocking the side view of the flower beds. 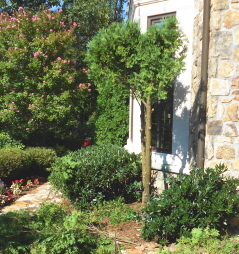 We started by cutting the lower limbs from the overgrown shrub, working our way up. One should proceed slowly with this because it is always possible to cut more limbs but not to put them back on. 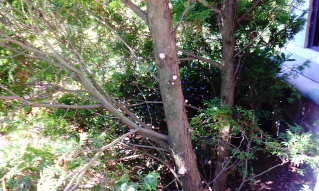 The best way to get a good job in tree forming is to cut a little and then stand back and study the situation. The plant now looks more like a tree. 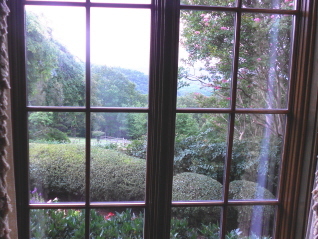 It no longer shades out the laurels and the view of the walkway. 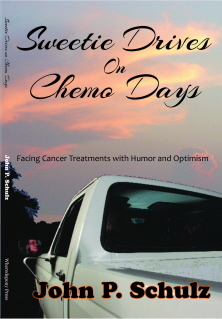 In a few months, we will trim the top to start the process of shaping it while it grows. I can envision it providing a canopy over the laurels and part of the walkway. If we keep the top cut, it will bush out and do just as the picture in my head dictates. 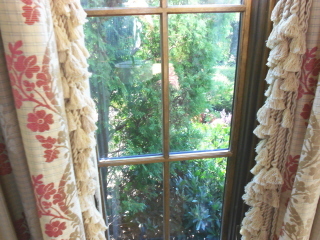 We did the same to the arborvitae on the other side of the window. We did some major surgery on a crape myrtle on the other side of the walk way that was also blocking the view and then we studied an overgrown yaupon tree further down the walkway. The pruning had opened up the view of the walkway and made it much more open and pleasant. The pruning process has opened up the view of the rock walkway and enhanced the comfort of walking through it. 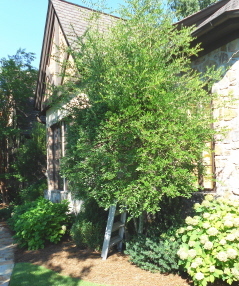 And we can now see through the arborvitae to enjoy the flower beds on the walkway. 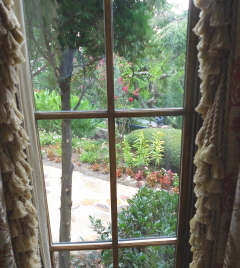 Now we can see the flower beds from inside the living room. It lets in a lot more light, too. 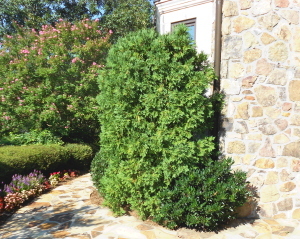 Keep in mind that you can use this tree form pruning process on all sorts of trees and bushes. 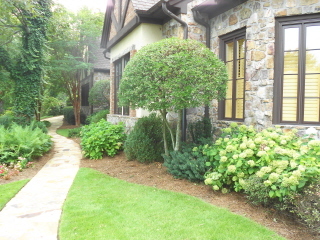 It really adds elegance to your landscape garden. I love your windows! But aside from that point that’s irrelevant, your garden is looking splendorous! 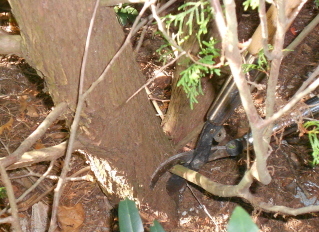 Pingback: Pruning a Japanese maple | Johntheplantman's stories, musings, and gardening. 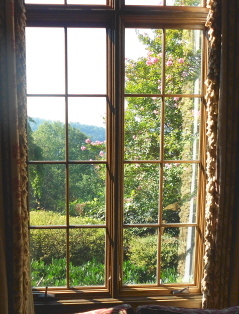 Pingback: Design a Landscape To Be Seen Through the Living Room Window | Johntheplantman's stories, musings, and gardening.